It was rainy and cold in Swindon at 0745 on Saturday 16th April 2016 but as we travelled south and west the sky cleared the cloud lifted and the temperature rose to 10 degrees. Nigel and Jess Rowe arrived at the club early to set up the ops room for their first stint as Race Officers. Giles the boatman was there , ready to go but no boat? Some motor boaty had taken our dinghy off the outhaul and put it on another mooring!! Giles managed a lift out with a passing gig and all was resolved. Nigel and Jess set up for a Northerly wind giving a first round of Black Rock and Vilt to port. On Trifle we set up for a port pole kite and I went through the gybe procedure with my young crew. The gusts came down the river with increasing strength and we set up a number two genoa. 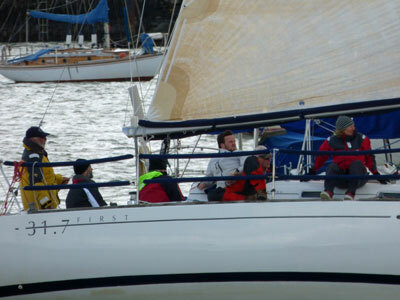 We then saw Bob Chapple in Wilkie, a GK24 who had come around from Mylor with a reef in the mainsail. I think we will start under Genoa and see what its like off the docks, I said to my crew. Ida, Mike Swingler's new Hawk set off first followed by the two folkboats, Mandy and Dave Owen in Aurora and David Mitchell in Aries. Len Cheshire in Sweet Friday then started followed by Trifle with a no 2 Genoa pulling hard in the gusts. Wilkie, Bob Chapple and Popincoota, Alan Grose in GK24s then started. Last but not least was Charles Choak in Minx. All of the start times had been adjusted to allow for the winners and losers of last Saturday to try to compress the fleet together in the pursuit race. As we got off the docks and headed towards the Black Rock Lateral bouy I said to my crew ,” If we put the spinnaker up we will not go any faster but might go sideways instead”. The wind was strong , averaging 25 kts with stronger gusts. There were large cumulus clouds indicating a buoyant atmosphere leading to big windshifts. The fleet rounded Black Rock in starting order and then began the beat up wind and uptide to the Vilt bouy. Which way to go? On Trifle we thought about tacking over and lee bowing the tide out of the harbour. However the front end of the fleet had gone up the eastern shore and we decided to keep in touch. Wrong!! Wilkie and Popincoota went up the western shore and Minx went right up the middle. Aurora was first around the Vilt followed by Ida. Aries then rounded followed by Minx, Sweet Friday and Wilkie who had made an enormous gain up the western shore. Trifle managed to hold off Popincoota. We all reached back up the harbour and eventually had to beat toward the turning mark off the clubhouse. Nigel and Jess gave the appropriate double hoot indicating a shortened course for the second round, setting Governor and Trefusis both to port. Aurora held on to their lead finishing first with Minx coming second. Ida held off Aries into third place, closely followed by Wilkie. Sweet Friday led Trifle who beat Popincoota . We went back to the club where Pauline Chapple fed us delicious Victoria sponge and tea. Malcolm and Sue Clark, the well established Cornish Bards, opened the bar after processing the results. A deal of “What happened was...?” with friendly rivalry ensued. The end of a great early season racing. Minx and Wilke have it all to do next week at the conclusion of the series.